it is what it was designed to be , an insurance system where those who die pay for those who live . you are wasting your time dwelling on what it should be , could be or is . this is what we have. your time is better spent working on playing the cards your dealt instead of complaining about the dealer . if people spent as much time learning all the ins and outs of good retirement planning and integrating things with ss they would be a lot better off then complaining about things they can't change . put your time in to what you can control . Of course, proof means nothing--it's a fact that they spent all the money they collected on other government foolishness like pointless foreign wars, and that the SS system is a Ponzi Scam that is illegal for everyone except government -- but there is absolutely nothing you can do to bring the Ruling Class to justice, or recover the money they've stolen. Making the word "fact" bold doesn't make it true. The Social Security Trust Fund was created in 1939 and in those 80 years it has never been mingled with the general funds of the US government. This fund is invested in government securities which pay the fund interest and return their investment upon maturity, just like any other government bond. US Government can use that borrowed money to do whatever they want. Saying congress raided the Social Security funds is like saying congress raided my Aunt's retirement account to buy F-35s because she bought US government savings bonds and that's how they spent the money she invested. now you are letting facts get in the way of his good story ... stop that! Maybe you can explain how these government securities gets cashed in to pay recipients when current contributions don’t meet current obligations. Bonds have been expiring and being repurchased for decades now. What will happen is the trust fund will buy less treasury bonds as demand for cash rises until ultimately they can't buy anymore bonds (trust fund is depleted). At this point there will be a choice, continue paying benefits and borrow / tax to pay them or pay 75% or so of benefits. This number will change based on economic output, number of retirees and inflation adjustments. What will that do to the treasury markets? Well the change will be slow so there will be time to adjust but ultimately higher interest rates as a significant amount of demand will be removed from the market. Looking for solutions to keep SS solvent. Those that are working are supporting everyone. Why not allow for SS benefits to be paid out irrespective of whether or not someone continues to work at age 65, or 69? Even if someone is making $100,000 in income at 65, that's still a contribution of $6200 from them and $6200 from their employer going into the program for direct SS payments, and the income tax generated will likely, in total, net to a surplus to the government. Plus, many companies create a lot of value per employee far beyond the cost of the employee. A higher workforce percentage is good for a country. Finally, people who are active tend to live longer and remain healthier. Sure that means they collect longer, but the longer they produce, the more realistic the program becomes. You CAN get SS, even though you're still working. It's just that there's a formula that cuts the benefit you get at that age, if you are still working. That amount that is cut is NOT taken from total amounts you'll get. Those amounts will be added to your benefits in the future. I don't think SS benefits should be taxed at all. These benefits were already taxed at least once. Taxing SS encourages people to keep their income below a certain level, when they are still working. It's incorrect to say that working people support everyone else. Paying into Social Security is going toward supplementing those who worked like the working people, and are thus missed getting that money while they were working. Like the current working people will find out. Everyone who has worked the required length of time to get SS has paid for Social Security for everyone, whether still working or having worked in the past. Of course, parents who choose to have children SHOULD pay for them. So they should be left out of the equation. Social Security only applies to people who worked in the past or are currently working. That doesn't include children, usually. it is not taxing ss so much that keeps people's incomes lower . it is the fact that many want to double dip , and have to give back ss money once they exceed 1420 a month pre fra. the taxing of ss can be an issue even not working . merely pulling an extra 1k out of an ira can see 47% of that extra 1k vanish because of the way the two moving targets work . Contributions were greater than obligations for decades, so the trust fund grew to almost 3 trillion. At some point recently (2009? I forget exactly) obligations became greater than contributions but they have been able to continue meeting obligations without shrinking the trust fund due to interest on those bonds being greater than the shortfall. However they expect the trust fund to be exhausted at some point around 2030-2035 at which point without changes they will only be able to meet about 75% of obligations. It's quite transparent, both SSA and CBO regularly release reports on state of social security, which of course rely on projections for GDP/population/taxes decades into the future so it's a best guess that is constantly revised. In reality, it is Enron accounting. The general fund has to make up the difference. When there is not enough in the general fund, the government borrows money increasing the debt. It doesn’t matter how much they claim is in the SS IOU’s, we are running deficits due to SS obligations. Conducting business this way is illegal for states and individuals. Nevertheless, future generations are getting the shaft to pay our current unfunded obligations. In reality, it is Enron accounting. The general fund has to make up the difference. It is nothing like Enron accounting, unless "Enron accounting" is a buzzword for anything financial you disagree with or don't understand. Enron hid massive debts from risky business ventures that failed, the Social Security Administration isn't making any risky investments and they are completely transparent on their accounting. You want to know how much is in the trust fund or when it'll be depleted it's in publicly available reports created using audits by internally and by CBO. The general fund isn't making up the difference because the SSTF hasn't been depleted. It doesn’t matter how much they claim is in the SS IOU’s, we are running deficits due to SS obligations. Conducting business this way is illegal for states and individuals. Nevertheless, future generations are getting the shaft to pay our current unfunded obligations. False. 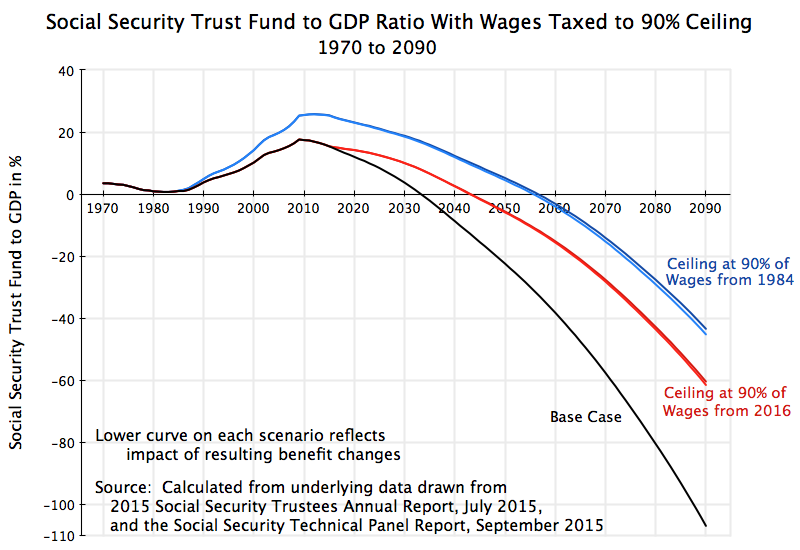 Social security has been completely self-sustaining since inception, therefore it has zero impact on deficits. There is nothing illegal about it.